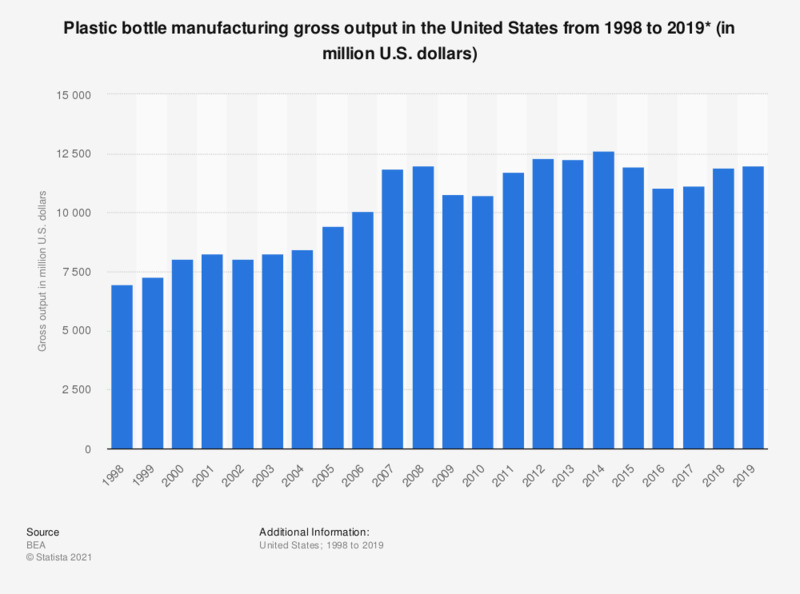 This statistic shows the plastic bottle manufacturing gross output in the United States from 1998 to 2016. In 1998, the gross output in this sector came to approximately seven billion U.S. dollars. Until 2016, the output increased to almost 12.5 billion U.S. dollars. * All figures in current U.S. dollars. Figures for 2014 and 2015 were updated in the 2017 edition of the report. All data was revised under the 2014 Comprehensive Revision of the Industry Economic Accounts. Everything On "Plastic waste in the U.S." in One Document: Edited and Divided into Handy Chapters. Including Detailed References.